[Homeschool Review Crew Review] Critical Thinking Co.
H just turned six a few months ago and we think she’s pretty advanced when it comes to her language skills. I know, I know every parent says that but hear me out. First, her first word was at six months, which really isn’t impressive until you learn that she used multi-syllable words like “ruckus” and “adventure” before she turned one. Since then, her vocabulary has grown exponentially and she regularly — and correctly — uses words like “ornery” and “moratorium”. This is why when we had the chance to review Vocabulary Riddles I by The Critical Thinking Co., we immediately thought that it was a great opportunity for H to challenge herself. Vocabulary Riddles I is a book that aims to improve a student’s vocabulary through the use of context clues in a sentence. It is meant to be used by Grades 4-8, although in our case, our daughter who is a first grader was able to use it. I did, I should note, offer a lot of guidance. According to the book, the words come from different sources like The New Yorker and the New York Times. These words are also helpful to build up their PSAT and ACT vocabulary. The book starts out with a riddle, which is usually alliterative, and the child is supposed to answer questions about it later. These questions are prompts in order to analyze the words and find out the meaning of the whole sentence. For example, the student is supposed to identify which one is the antonym for a particular word. Then a synonym. The next question is to indicate what part of speech a certain word is. Finally, the last question is to identify which sentence explains the original riddle. The synonym-antonym-part of speech combination is a recurring theme in the book. Vocabulary Riddles I also devotes the last few pages to the correct answers so it is easier to check. We used the electronic version of the book, but I understand that there is also a physical copy. It’s a pretty short book with only 30 pages, but each riddle is already packed with so many words to learn so there’s a lot of value in it. The download was easy and the use of the website is pretty straightforward. This was a noteworthy point because I noticed that there are a lot of websites that make you meander through their pages to get you to buy more stuff. After choosing the product, you download your copy and key in the serial number you receive. Since my daughter is outside the recommended age, we took things pretty slowly. We also used it a bit differently from how older kids would. I read the sentences to her and asked her read them back to me. (Using this as reading practice was an unexpected bonus.) Then I asked her the questions with a lot of follow-ups to help guide her towards the answers. With words like “bunkum” and “contumacious”, she got a lot of questions wrong. Obviously. But, she also did get some right. There are also some easier words like “audacious” and “bewildered’, which are, I think, age-appropriate challenges for her. For those parts that went over her head, I used it as a good time to introduce the dictionary and how to use it. I remember being stressed out over learning vocabulary words whenever I had to take those government-mandated tests and for the college entrance exams. I could saved myself a lot of grief if I were exposed to bigger words when I was younger. This is why I love the idea of having a series like this (There is a Vocabulary Riddles II) because it doesn’t belittle the abilities of kids. I completely agree with the approach as well. When the words are presented in riddle or sentence form, they understand the meanings more organically and within context — as opposed to just memorizing them on flash cards. It makes more sense to learn words if you know how you will use them. I can also see how the method of asking for the synonyms, antonyms, part of speech, and having them reword the sentence can be applicable to other situations. Once the student develops the habit, it’ll be easy to break down other sentences that can be encountered in the future. 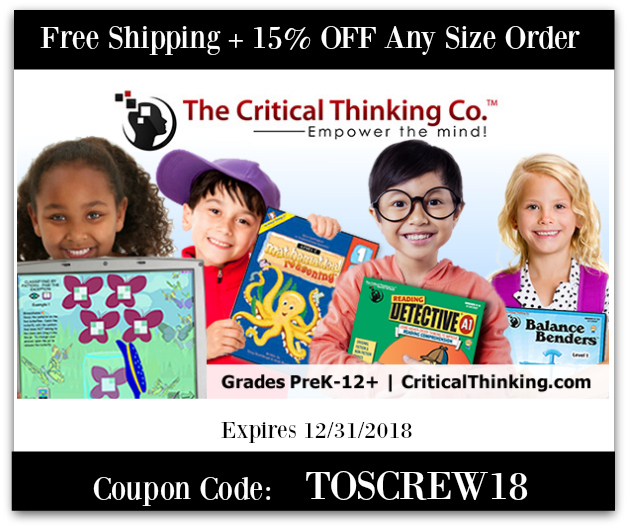 If you are interested in the product, The Critical Thinking Co. has a special offer: free Shipping + 15% off any size order. Use coupon code TOSCREW18. This code expires 12/31/2018. You can also sign up for free Critical Thinking Puzzles. You can choose PreK – Grade 8 puzzles delivered weekly to your inbox. Sign up here. Find out more about Vocabulary Riddles I and Critical Thinking Co., you can visit their social media pages. 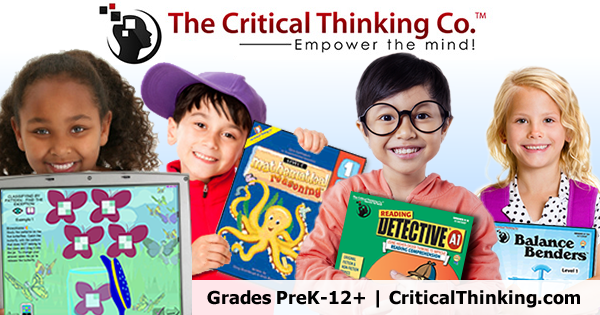 Other homeschooling families have also tried out the different products of The Critical Thinking Co. You can read their reviews by clicking the image below.